Smithsonian National Museum Of African American History And Culture Celebrates 1 Year Anniversary : The Two-Way Thousands of people flock to the museum each day, making it one of the most popular Smithsonian destinations in the nation's capital. Lucille Simpson, far right, and her daughter Gwendolyn Norman, both from Detroit, Mich., wait in line to enter the Smithsonian National Museum of African American History and Cultural on the National Mall in Washington, D.C., on May 1. It's been one year since bells tolled along the East Coast, welcoming the newest Smithsonian to the National Mall in Washington, D.C. Since then, the museum has attracted more than 3 million people of all races, colors and creed from across the nation and around the world — averaging about 8,000 visitors daily. "This has become more than a museum. 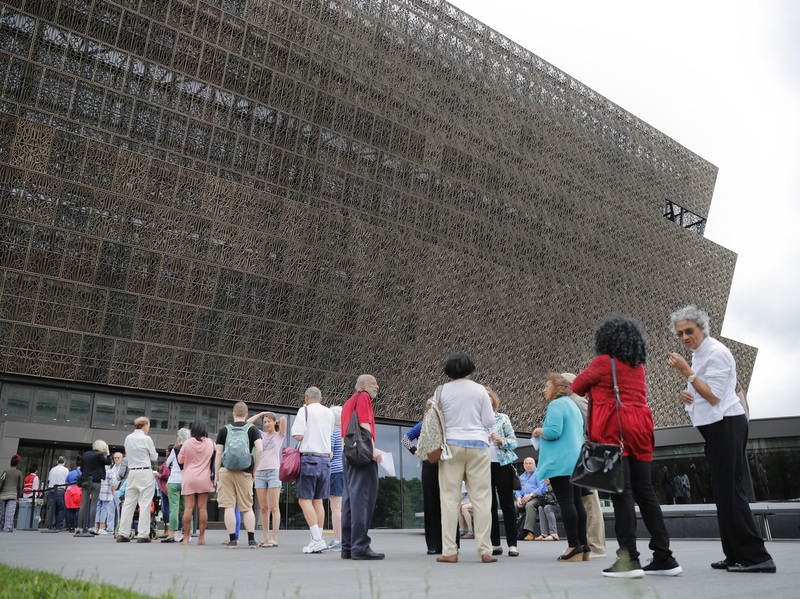 This has become a pilgrimage site," said Lonnie Bunch, founding director of the Smithsonian National Museum of African American History and Culture, in an interview with The Associated Press. The one-year celebration is highlighting the various aspects of African-American history through music, dance and storytelling. Exhibits at the museum range from the glass-topped casket used to bury lynching victim Emmett Till to a fedora owned by late pop superstar Michael Jackson. Many of the artifacts come from people's homes and personal collections — like freed slave Joseph Trammel's tin wallet, handmade to protect his freedom papers. "Because you have these collections, it allows people to open up and to share stories to find memories," Bunch told the AP. "I've heard many times people say, 'I forgot, but once I saw a segregated door or once I saw that washboard it brought back those memories.' "
Unlike other museums, the National African American Museum of History and Culture encourages people to leave something behind when they visit through a feature they call Visitor Voices — an area where people can talk about life as an African-American in the United States. More than 8,000 people roam the museum's halls daily — twice the amount that organizers had originally anticipated. Dawn Robinson traveled from Richmond, Va., to celebrate the historical contributions of her ancestors. "History in general shows us there's been a lot of tragedy and a lot of triumph, and the African-American experience is no exception, so I think it's just good that African Americans are finally being honored," Robinson says. The museum took years to build with more than a dozen failed votes in Congress over funding — and then controversy over where to build it. Ground for the $540-million facility was finally broken in 2012 on a 5-acre tract near the Washington Monument. It was completed in 2016 with former President Barack Obama presiding over the opening ceremony. "It is an act of patriotism to understand where we've been," President Obama said to a standing room-only crowd. The nation's first black president marked the September opening with the ringing of a church bell. Former President George W. Bush and luminaries from politics and entertainment were also in attendance. President Trump toured the museum shortly after his inauguration. "This museum is a beautiful tribute to so many American heroes," Trump said after his tour. "It's amazing to see. We did a pretty comprehensive tour, but not comprehensive enough." 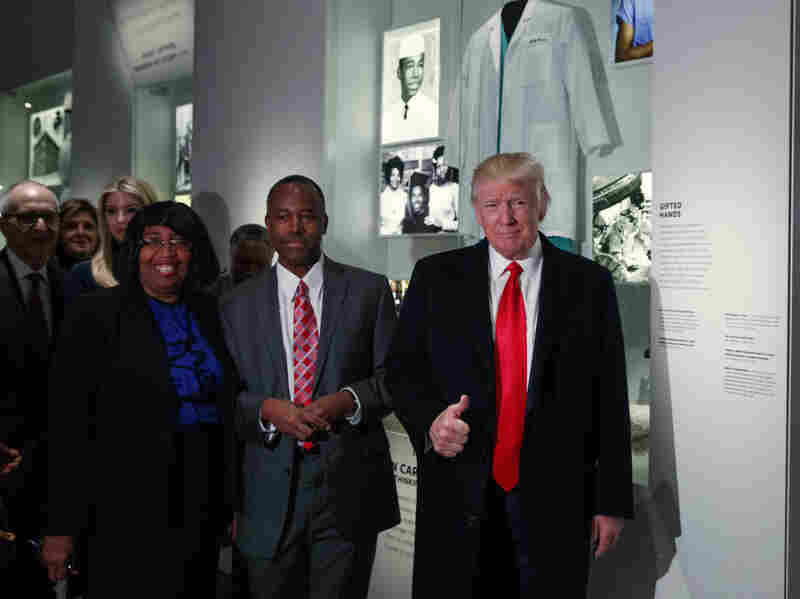 President Donald Trump gives a thumbs up during a tour of the National Museum of African American History and Culture with Housing and Urban Development Secretary-designate Dr. Ben Carson. The president, who was joined by First Lady Melania Trump and his daughter Ivanka, pledged to bring the country together and vowed to close racial divides. Trump made a concerted effort to reach out to African-American voters during the campaign, including through events hosted by his National Diversity Coalition. But, particularly in the past few days, critics have cast the president as racially divisive. His comments blasting NFL players who kneel in protest during the national anthem, "reigniting criticism that he is divisive and insensitive," as NPR's Vanessa Romo reported on Sunday, "a month after Trump struggled with criticism of his multiple remarks in response to violence in Charlottesville, Va."